^ Palestinian National Authority. World Statesmen.org. Ben Cahoon. [8 June 2014]. （原始内容存档于2014年2月8日）. ^ Palestine (includes audio). nationalanthems.info. [8 June 2014]. （原始内容存档于2014年3月31日）. ^ Ban sends Palestinian application for UN membership to Security Council. United Nations News Centre. 23 September 2011 [11 September 2015]. ^ Bissio, Robert Remo (编). The World: A Third World Guide 1995–96. Montevideo: Instituto del Tercer Mundo. 1995: 443. ISBN 978-0-85598-291-1. ^ Lapidoth, Ruth. Jerusalem: Some Legal Issues (PDF). The Jerusalem Institute for Israel Studies: 26. 2011 [5 June 2014]. （原始内容存档 (PDF)于2014年6月5日）. The attitude of the Palestinians was expressed inter alia in 1988 and 2002. When the Palestine National Council proclaimed in November 1988 the establishment of a Palestinian State, it asserted that Jerusalem was its capital. In October 2002, the Palestinian Legislative Council adopted the Law on the Capital, which stipulates that Jerusalem is the capital of the Palestinian State, the main seat of its three branches of government. The State of Palestine is the sovereign of Jerusalem and of its holy places. Any statute or agreement that diminishes the rights of the Palestinian State in Jerusalem is invalid. This statute can be amended only with the consent of two-thirds of the members of the Legislative Council. The 2003 Basic Law also asserts that Jerusalem is the capital of the State of Palestine. Reprinted from: Wolfrum, Rüdiger (ed.) (online 2008-, print 2011). The Max Planck Encyclopedia of Public International Law. Oxford University Press. ^ Declaration of Independence (1988) (UN Doc). State of Palestine Permanent Observer Mission to the United Nations. United Nations. 18 November 1988 [8 June 2014]. （原始内容存档于2014年6月8日）. ^ Miskin, Maayana. PA Weighs 'State of Palestine' Passport. israelnationalnews.com. Arutz Sheva. 5 December 2012 [8 June 2014]. （原始内容存档于2012年12月7日）. A senior PA official revealed the plans in an interview with Al-Quds newspaper. The change to 'state' status is important because it shows that 'the state of Palestine is occupied,' he said. ^ State of Palestine name change shows limitations. AP. 2013-01-17. （原始内容存档于使用|archiveurl=需要含有|archivedate= (帮助)）. Israel remains in charge of territories the world says should one day make up that state. ^ The World Factbook: Middle East: West Bank. cia.gov. Central Intelligence Agency. 7 April 2014 [8 June 2014]. （原始内容存档于2014年5月6日）. ^ The World Factbook: Middle East: Gaza Strip. cia.gov. Central Intelligence Agency. 12 May 2014 [8 June 2014]. （原始内容存档于2014年6月8日）. ^ Estimated Population in the Palestinian Territory Mid-Year by Governorate,1997-2016. 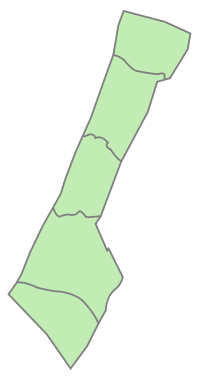 Palestinian Central Bureau of Statistics. State of Palestine. [8 June 2014]. （原始内容存档于2014年6月8日）. ^ GINI Index: West Bank and Gaza. The World Bank: Data. [8 June 2014]. （原始内容存档于2014年6月8日）. ^ 殷罡：巴勒斯坦阿拉伯国法律地位的确立. 《阿以冲突：问题与出路》一书第8、9、10章，国际文化出版公司，2002年版. 共识网. 2014-07-14. （原始内容存档于2015-12-08）. ^ Abbas Dissolves Palestinian Authority Government in Wake of Hamas-Fatah War. 2007-06-14 [2007-06-14]. （原始内容存档于2007-06-16）. ^ 圣座. 梵蒂冈正式承认巴勒斯坦国 以色列对此表失望. 梵蒂冈（教廷）. 2015年6月 [2015年5月14日]. ^ Saint Lucia establishes diplomatic relations with the State of Palestine. St. Lucia News Online. 2015-09-16 [2016-07-27]. ^ 29.0 29.1 歐洲議會決策 2017/154 恐怖組織名單. 2017年1月27日 [2019年2月22日] （英语）. ^ 外交部. 中国同巴勒斯坦的关系. 中華人民共和國. 2013年6月 [2014年12月21日].